Dear Mr. Camdessus, We, the undersigned, hereby draw your attention to a major issue of economic and ecological concern in Indonesia in the context of your institution's current efforts to address the country's monetary and financial crisis. 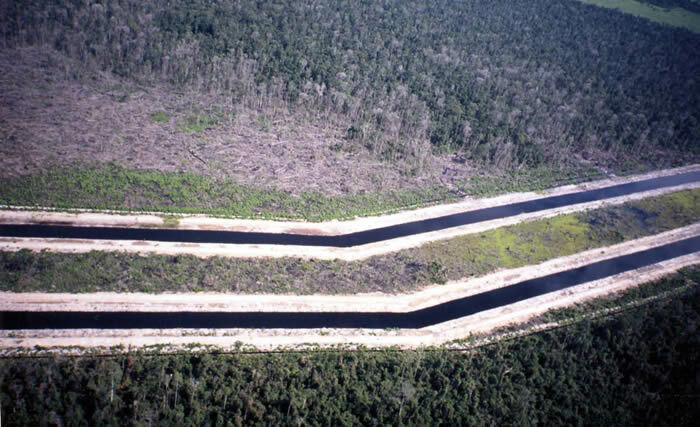 This is the so called Mega-project in Central Kalimantan province, a development project which is intended to convert over one million hectares of peat-swamp forest into a rice-producing area. The request in this letter represents concerns shared by many institutions and individuals in Indonesia and internationally. Not solving this issue may seriously hamper the financial sustainability of the solutions the IMF is proposing to Indonesia. We refer in this respect to seve ral expressions by representatives of your institution and yourself on the close interrelation between macro-economic stability and ecologically sustainable use of natural resources. Recently your Deputy Alassane Ouattara spoke at the World Bank's Fifth Annual Conference on Environmentally Sustainable Development on October 7, 1997. Amongst his many important remarks was the following: "We also know that environmental problems, including those relating to specific regions and the world as a whole, hurt growth. Human welfare is reduced by ill health and premature mortality caused by environmental problems. Moreover, health problems can lead to higher outlays aimed at mitigating or avoiding the health and other direct welfare impacts of environmental degradation – further constraining growth. Studies also give abundant evidence of lost labor productivity resulting from ill health, forgone crop output from soil degradation, lost fisheries and tourism receipts from coastal erosion." Almost all this applies directly to the Mega-project, to which should be added the onslaught of the project on wildlife and the tremendous burden on the budget of the country. In the Annex the dramatic social, ecological and economic consequences of the project are described in detail. If necessary, experts from our side are willing to testify at your convenience. We urge you that cancellation of this project and a new development programme including rehabilitation of the damaged zones be included in your negotiations with the Indonesian government. We are very grateful for your attention to this letter and the Annex. Sincerely yours, S. lndro Tjahyono SKEPHI, Indonesia Frances Carr, Down to Earth (UK), International Campaign for Ecological Justice in Indonesia, Hemrno Muntingh, Tropical Rainforest Program of the International Fund for Animal Welfare (IFAW) Saskia Ozinga, Ariane Crampton FERN (UK & EU Offices) Wouter Veering, Netherlands Committee for 1UCN Paul Wolvekamp, Borneo Forum (Netherlands) Marcus Colchester, Forest People Programme of the World Rainforest Movement (UK) Gabriel Rivas-Ducca, AECO - Friend of the Earth (Costa Rica) John Kunzli, Bruno Manser Fonds (Switzerland) Max Ooft, International Alliance of Indigenous and Tribal People of the Tropical Forests Reinhard Behrend, Rettet den Regenwald (Germany) Ricardo Carrere, International Office of the World Rainforest Movement (Uruguay) Maurizio Ferrari, World Rainforest Movement (UK Office) Kazuko Matsue, Forest Research Centre (Japan) Jaime Rafael Guillen Vallejos, Nicambiental (Nicaragua) Gary R. Burniske, Rainforest Foundation International Rainforest Foundation, Norway; more see PDF.